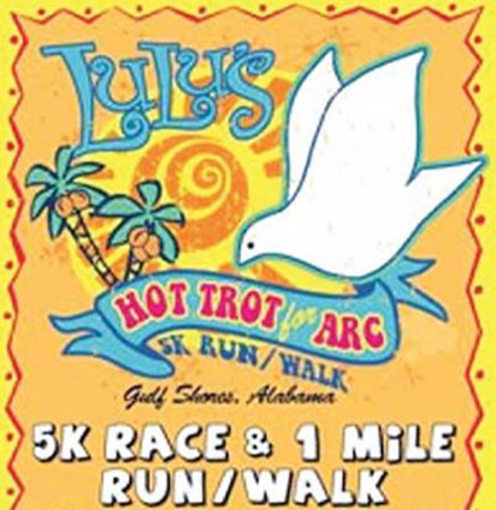 LuLu's Hot Trot for ARC 5K Run/Walk is a fundraising event conducted by the Robertsdale Rotary Club, through the Robertsdale Rotary Foundation will be held at Lucy Buffett's LuLu's in Gulf Shores. Packet pick-up will be held at Lulu's on Friday, June 14 from 4 - 6 p.m. Day of registration starts at 6 a.m. The event will be held Saturday, June 15 at 7:30 a.m. The race course is flat, quick and certified! All net proceeds are donated to the Association for Retarded Citizens of Baldwin County.